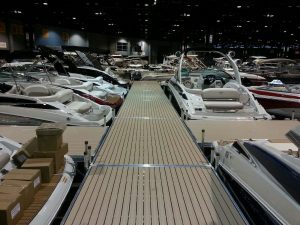 Metal Craft Docks is proud to have authorized dealer BruceSki’s Marine Construction representing our product at The Progressive Chicago Boat, RV & Strictly Sail Show. The Chicago show is one of the largest recreational shows in the country and runs from January 14th through the 18th. Joel and Ryan Bruce will be on hand to assist you if you are in need of a new dock or lift and to answer any questions you have about Metal Craft products. Interested to see how Metal Craft products perform? Take a walk on our Commercial Display Platforms and Stair System on display at the show and installed by Bruceski’s Marine Construction located in the Fox Lake Harbor Booth. For more information on the activities and exhibitors at The Progressive Chicago Boat, RV, & Strictly Sail Show, visit their website atwww.ChicagoBoatShow.com.